That’s right, we’re starting this blog article off with a Monty Python reference! I know, I know – I couldn’t possibly get any cooler, right? Whether or not Monty Python sketches are your brand of humor, they have permeated our entertainment culture. Most people at least recognize the classics, such as “tis but a scratch!” and “run away, run away!” (from the deadly bunnies). Today I want to talk to you about a sketch involving King Arthur and a mysterious Black Knight who guards a “bridge” (a board over a tiny stream). 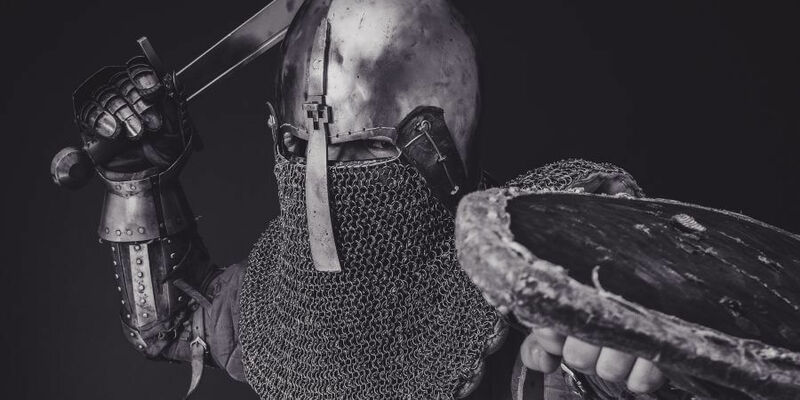 For reasons unknown to any but himself, the Knight refuses to allow Arthur passage, forcing Arthur to engage him in a duel for the right to travel on. As the battle progresses, Arthur quickly proves victorious, slicing off the Knight’s left arm. Almost apologetically, he tries to get the Black Knight to concede and allow him to pass. The Knight, however, refuses and utters perhaps his most famous line: “Tis but a scratch!” Arthur continues to battle the Knight, chopping off limbs one by one until the Knight is just a torso sitting on the ground, shouting insults at the King as he rides away. The scene is ridiculous and humorous because of the Knight’s sheer contrary stubbornness, as well as Arthur’s growing incredulity and annoyance. It’s also a great example of how ignoring your wounds can be dangerous. The Black Knight did not initially get himself into trouble for defending his bridge, although it was not, strictly speaking, necessary for him to do so. What got him into trouble was his absolute focus on not acknowledging his wounds and refusing to stop fighting to attend to himself. Although the scene ends with Arthur riding away from the Knight, we can reasonably assume that anyone suffering such extensive injuries would die of blood loss in short order. The Knight was too busy calling Arthur a coward for fleeing, and threatening to bite off his legs, to care for his wounds in any way. So how does this tie in to anything related to healing from narcissistic abuse? This: there’s a very good chance that the narcissist in your life is also a Black Knight. As we have discussed in previous articles, group sessions, and the workshop, narcissism does not exist in a vacuum. Most narcissists develop emotionally abusive behaviors as a way of coping with their own pain. By and large, that means shifting pain and/or blame onto someone else, because it is intolerable to most narcissists to feel their own wounds. You are probably familiar with the effects of having your pain invalidated or dismissed. It is shocking and hurtful to be told that the pain you are experiencing is inconsequential, all in your head, or simply doesn’t matter to someone important to you. In many cases, these statements are a direct repetition of how your narcissist was raised to respond to their own pain. We all learn about relationships from the people closest to us (whether those lessons are good ones or bad). And when your arm’s off, and your family says it is no big deal, you have two choices. You can force the issue and insist on being taken seriously. Or you can agree with the messages you are receiving and continue on, bleeding from your stump and becoming more and more wounded. Narcissistic individuals may vacillate between two extremes, alternating between exaggerated emotional reactivity in order to provoke caretaking responses in loved ones and ignoring their wounds even though they’re bleeding all over the place. And it’s the bleeding all over part that is most problematic. Because when you ignore a sucking chest wound or an amputated limb, there’s no possibility for healing it. What do these wounds look like in real life? We all carry wounds, and we must all figure out how to get through life with our pain. But to simply continue taking on every fight without ever pausing for rest or healing is to set ourselves up to be mortally wounded. When those wound occur in the context of relationships that should be loving, it warps our perspective of how relationships should look, feel, and function. Individuals who have experienced emotional abuse and neglect and who do not ever attend to their injuries risk becoming emotionally abusive themselves. They risk taking on the traits and behaviors that caused their own pain and passing them on to the next generation. Willfully blinding oneself to pain, while at times a necessary survival trait, represents a significant risk for carrying on a legacy of wounded relationships. This is perhaps the main reason that so many adult children of narcissists can trace their parents’ abusive traits back through multiple generations of emotional neglect and harmful behaviors. If wounded parents cannot or will not bring healing to their wounded parts, they will become more and more wounded until they are incapable of wholeness and unconditional love. And they will teach their children that survival means ignoring what pains you, because pain is weakness. All wounds become flesh wounds, and it is considered weakness or cowardice to attend to them. This article is not about trying to make you feel bad for your narcissist, although sometimes people do feel compassion when they understand how wounding creates more wounding. What I want to highlight is why it is so important for you to do the hard work of healing your wounds. Unhealed wounds can leave a person so impaired that they can’t possibly function in a healthy way. They may not know how to to relate to their children with unconditional love. They then pass on a legacy of pain and emotional abuse, continuing the cycle. The good news, though, is that you can change that. Take as much or as little time as you need to do your healing work. Take breaks from it if you need. But don’t forget to come back to it. You can create a new family legacy, beginning with yourself, of self-compassion and healing from pain. Because the world has enough Black Knights running around bleeding on everyone, and you deserve care and kindness from yourself. What kind of a world could we create with more self-compassion and love for our wounded parts?